After a brief visit to Romania, we spent a few days in Hungary’s capital Budapest. The 1.7 million inhabitants metropolis formerly consisted of two cities, located west and east of the Danube river. One was called Buda, the other Pest. The largest spa town in Europe is, among other things, famous for its bathhouses and thermal springs. Incidentally, in a geotectonic view, the city lies on a fracture point of the earth plates. Therefore, the city (especially Buda) is rich in hot springs, which were already used by the Romans in the second century. In total, there are over 120 hot springs in the city, while the water is used in 21 baths. Altogether, the Hungarian parliament took 19 years (1885 – 1904) to built. The building is one of the largest in the world and has a length of 268 meters. It houses 10 courtyards, 13 elevators, 27 entrances, 29 staircases and 691 rooms. The outer walls are decorated by 365 turrets, which are hardly noticeable in the imposing structure. 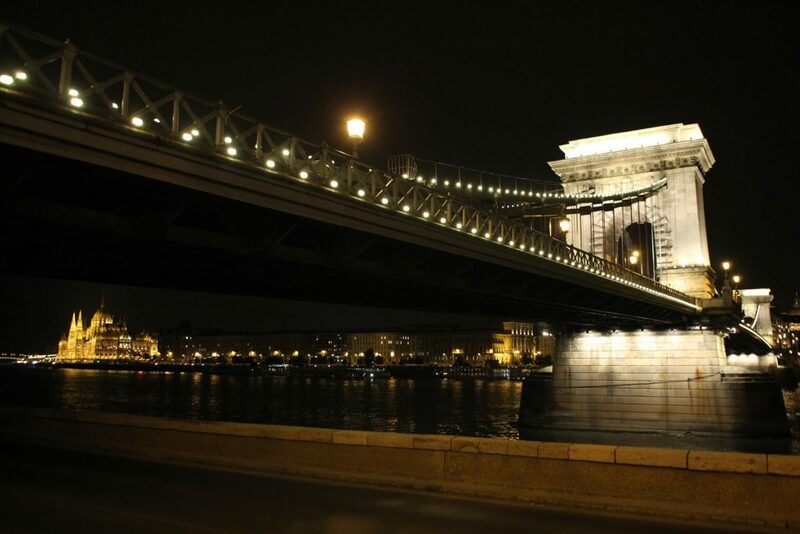 At night, the building is bathed in light and offers one of the most beautiful photo opportunities in Budapest. A Hungarian proverb says, that the British Parliament may be bigger than the one in Budapest, but the Hungarian Parliament is the most beautiful in Europe. I agree. Unfortunately, we did not take the time to do a tour in the Parliament. By the way: The entrance fee is divided into EU and non-EU citizens. The former pays 2400 HUF (8 Euro), the second 6000 Forint. In my opinion, this system is idiotic, but we experienced a lot in terms of “making money from tourists” in Budapest. Every toilet, every slice of bread and every little extra got charged. For example: We had to a cold plate “Hungarian style” with sausages, cheese, etc. and hat to pay the appendant bread as well as the necessary second one. Annoying! Also, the Hungarians include their tip generally in the bill. Whether the service was good or bad, doesn´t matter to the waiter. The city has a lot to offer for architecture enthusiasts. In the city center alone, there is the Parliament, the Fisherman’s Bastion, the St. Stephen’s Basilica and the Chain Bridge, to only name a few of the popular attractions for tourists. People who like to walk do not need a bus ticket for most of the sightseeing. By the way, a single bus ticket costs 450 HUF and should be bought in advance or with the exact (!) amount of money from the bus driver – otherwise you drive for free. At least we did. In addition to the attractive buildings, countless statues can be found in Budapest. From the “little princess” to the “fat policeman” and the “shoes by the Danube” to Ronald Reagon and the painter Ignac Roskovics – there are countless monuments in the capital of Hungary. In my opinion, the “Shoes on the banks of the Danube” have the most notable background: During the Second World War, Jews were rounded up and shot there. Around 3000-3500 Jews lost their lives this way. Photos of some of these sculptures can be found in the galleries, but there´s none of the 50-60 shoes. I forgot to take a pic. If you want to relax, take a trip to the Sziget-island, where every year in August, the famous Sziget Festival takes place. You will find nature and tranquility, a few music wells with water features and many opportunities to do sports. Not far from the island is the Lukács thermal bath, which we have preferred to the more famous pedants. It is not as splendid (according to pictures) as the others are, but we were almost the only tourists and there was little going on. The water is enriched with various ingredients, but no match to the volcanic springs in Papallacta. The stay was pleasant and recommendable anyway! We paid almost 100 euros for three nights in an unspectacular hotel in the city center, but had a room with two rooms (sooo much space) and an integrated bathroom. In my opinion, the price is justified. Especially when you look at the situation. When eating, I noticed that (at least in the tourist zone) the Hungarians try to squeeze every penny from the customers. The coffee and the food are still not exactly expensive, but the drinks in comparison are. Also, every little thing gets charged extra and the tip is already on the bill. In Hungary, a tip in the range of 10-13 percent is normal, on some bills, however, you can find 20-25 percent, that the menu never mentions. But, we have also experienced the exact opposite, when we had no suitable money and only had to pay as much as we could. To eat dinner in a restaurant was about 20-30 euros, as we spent most of the time in the old town and thus at more expensive stores, probably. The entrance fees to the individual attractions I checked was usually between three and ten euros, which in my opinion is also okay. In general, we had nice days in Hungary and will travel the country on occasion for a longer period. I especially enjoyed the Hungarian people and the food, that, while a little greasy, tastes delicious. In addition, the bus ride to Budapest gave us some impressions of the landscape and some cities, that definitely looked interesting. Incidentally, we flew to Spain after Hungary – Vinaros, part 2.